You just need to know what to do, where to do it, and how to implement it. That’s why DIYthemes is launching this new SEO training series. 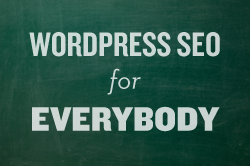 It’s called WordPress SEO for Everybody, and you’ll learn the latest SEO strategies that work. Now let’s proceed to the first tip. If you want your WordPress site to rank higher in search engines, in addition to tweaking your WordPress category pages, you need to link your new articles to your older, relevant articles. But how should you link them? What posts should you link? What anchor text should you use? Well, first, you can link your articles using anchor text you’d like to rank for. However, that won’t propel you to top rankings by itself, and that’s where this quick tip comes into play. Instead of focusing on what you want to rank for, look at what you’re already ranking for. Take a second, and load up your Google Analytics. Look at your current keywords, and see the articles that already rank in search engines. If you’re not ranking #1 for any of the keywords that send you traffic, make sure you link those articles from your new stuff. It’s easier to improve your existing rankings, than it is to rank for something completely new. What do I mean by nuances? They’re not secrets, they’re just the way many top SEOs believe search engines work. As you know, search engine optimization is often an inexact Science, despite there being several search engine optimization best practices. When you link articles higher in the HTML—towards the beginning of your content—it passes more juice. If a link is above-the-fold, it’s probably more important than a link buried in the footer. So, when interlinking pages that are important, make sure you keep it as close to the fold as possible. If you link the same older, relevant article from within the same new post, search engines supposedly only use the first instance of a link in their algorithm. Why would search engines give preferential treatment to someone who often links only one article, with varying anchor text? Yes, you can do that when it’s coming from different new posts, but from within the same post? It sounds awfully like spamming, and it’s no wonder it doesn’t work. So, the key takeaway is, only interlink the same page ONE time. If you absolutely loved this article, make sure you sign up for free email updates to ensure you don’t miss out on the upcoming updates. Just enter your email in the blue box below, and you’ll be set.